Dimensions 1 by 4.50 by 7.25 in. Amazon.com description: Product Description: Composed by two prominent statesmen-generals of classical China, this book develops the strategies of Sun Tzu's classic, The Art of War , into a complete handbook of organization and leadership. 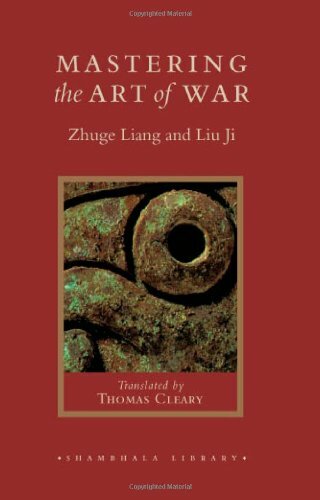 The great leaders of ancient China who were trained in Sun Tzu's principles understood how war is waged successfully, both materially and mentally, and how victory and defeat follow clear social, psychological, and environmental laws. Drawing on episodes from the panorama of Chinese history, Mastering the Art of War presents practical summaries of these essential laws along with tales of conflict and strategy that show in concrete terms the proper use of Sun Tzu's principles. The book also examines the social and psychological aspects of organization and crisis management. The translator's introduction surveys the Chinese philosophies of war and conflict and explores in depth the parallels between The Art of War and the oldest handbook of strategic living, the I Ching (Book of Changes).